I used to be one of those really lucky people that never had to worry about my weight. I would eat whatever I wanted, do minimal physical activity and still be fairly thin. But her words really snapped me back to reality. I did need to start paying attention to what I was eating because obviously, I wasn’t losing the baby weight. Since then, I’ve had three more kids and have managed to get back down to my pre-pregnancy weight. It hasn’t been easy. There isn’t a magic pill. There’s no weird trick. It’s just come from a boring combination of healthy eating, exercise, and a few must have things I’ve picked up along the way. 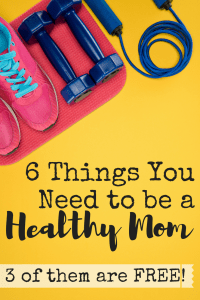 This post, Six Things You Need to be a Healthier Mom, contains affiliate links for your convenience. This means that if you make a purchase through the link, we’ll receive compensation at no additional cost to you. Read our full disclosure policy. We all need to drink more water. I love coffee as much as the next sleep deprived mom, but my body needs water more than java. So treat yourself and buy a container that you really like. I know, it’s just a vessel to hold water and that almost any old cup, bottle, or bowl will hold water, but drinking out of a special cup is better. Here’s why. I drink from a Yeti. For me, it is perfect because I love ice cold water. When I see it, I am reminded that my husband bought it for me specifically for drinking water. I remember that he spent a lot of money to buy it because I am worth it to him. You don’t have to spend a lot on a bottle. You just need one that you like because you deserve it. Your health is important because you are important and to be healthy, you need to be hydrated. Maybe you really like infused water. Maybe you really like room temperature water. However you like your water, buy a container that will make your water more appealing because water is essential to becoming a healthier mom. The benefits of wearing a step tracker are numerous ranging from weight loss and management to muscle building. According to John Hopkins, a fitness tracker can even help to improve your heart health. And whether you have an expensive one or a cheap one is kind of irrelevant. The point is that you’re keeping track of your activity level. You set a step goal for yourself and try to hit it every day. Now the Fitbit has some neat social features like being able to digitally challenge another Fitbit user, but my daughter and I challenge each other every day with our cheap trackers. We just have to communicate with words to issue and track the challenge. 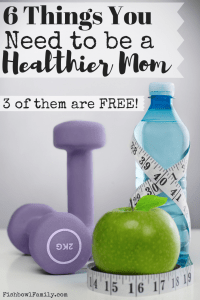 My effort to be a healthier mom has had the unintended side effect of helping my kids to be healthier, too. My daughter begged for a step counter of her own and, with a price tag under twenty bucks, it was a pretty easy yes. There are days she’ll see that she’s not close to reaching her step goal, and she’ll go outside and run around to get her steps up. Of course, the other three kids follow her, so they’re all getting exercise and fresh air. Everyone wants to eat healthier, but it’s hard. It’s easy to spend a couple hours on Pinterest pinning healthy recipes, but the reality of cooking skinny grilled chicken alfredo with zoodles is a little more difficult. The solution is to be realistic. Figure out ten easy, healthy meals that your family will actually eat and put them on heavy rotation. Throw in a couple of sandwich nights and some breakfast for dinner and you’ve easily done two weeks of dinners without a ton of effort or stress. To read more tips on realistic menu planning, check out our post, Realistic Menu Planning. Here are our top 10 easy recipes. They’re budget-friendly, healthy-ish, and kid approved. What more do you need?!? Boxclever Press Big Meal Planner & Magnetic Refrigerator Grocery List. Nearly US Letter size. Perforated shopping list pad with useful headings & weekly menu planner. Pocket for coupons & receipts. We all know those people that “don’t even own a scale,” and just “allow my body to be the weight it wants to be.” Which is usually like 105 pounds of annoyance in athleisure wear. My body wants Blue Bell and stretchy pants. I need a scale to tell me my weight so I can rein in my eating and up my activity. I’m not saying to obsess over it or to let that number define you. I am saying that it is useful to weigh at least once a week. We have this really awesome scale that calculates BMI, body fat, water weight, muscle weight, and other fancy things. It connects to a free app on your phone and makes a handy little graph for you. So if you’re working out and gaining muscle, it shows you. Or just get a basic digital scale and make your own graph. It really doesn’t matter as long as you are keeping up with your weight. Be sure to check out our post, Five Free Mom Splurges You’ve Got to Try. There are days that I walk 20,000 steps and don’t even get to sit down for lunch. On days like that, it’s important that you have a healthy snack that you can grab easily so you don’t stress eat a sleeve of thin mints because you’re so hangry you can’t adult anymore. My go-to snack is the Think Thin Salted Caramel Protein Bars. They taste pretty good for being a low carb, low sugar, 150 calorie bar. I also really like making these Peanut Butter Chocolate Chip Oatmeal Energy Bites from Melissa at Bless This Mess. Okay, love may be a little bit strong. But find an exercise that you don’t dread. For me, that’s Pilates. It’s low impact and all about building core strength which my mom bod desperately needs. I also enjoy jogging because it lets me get some time away from kids while listening to 90’s hip hop. What’s better than a little Ludacris in the sunshine? And please don’t take this as me saying you should join a gym. There are enough exercise pins on Pinterest that you could try a new one every day and never run out. The point isn’t to go out and spend a ton of money making a commitment to a gym membership. The point is to find an exercise that you can tolerate and commit to doing it several times a week because it’s good for your body. Your body has done some truly awesome things and deserves to be treated well. Every doctor will agree that healthy eating and exercise is good for you. So be good to you. 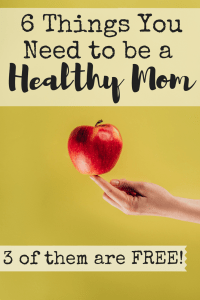 Your kids deserve to have a healthy mom that’s around for a long time. Otherwise, who will tell them to brush their teeth? What are some things you’ve found to help you be a healthier mom? Tell us in the comments! Like this post? Be sure to pin it so you can find it later! Great tips! I’m supposed to be focusing on my health this year, but it can be so HARD!!! #5 is critical for me. Pre-planning my snacks really helps me to stay on track! These are great ideas! 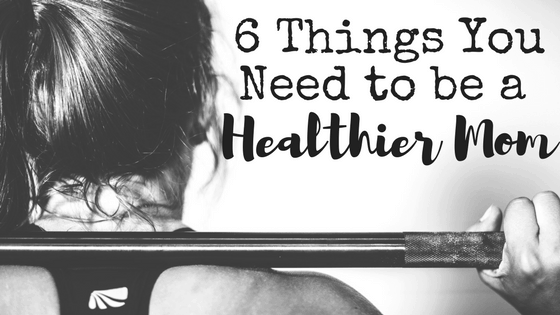 I am a faith-based health and wellness blogger so these ideas resonated with me. Thanks Denise! I love your blog!